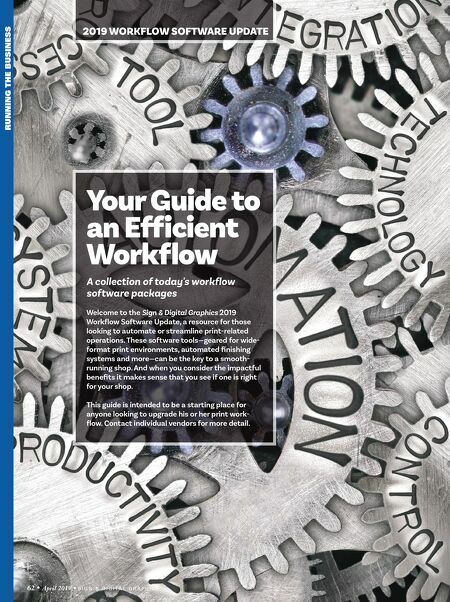 RUNNING THE BUSINESS 62 • April 2019 • S I G N & D I G I T A L G R A P H I C S 2019 WORKFLOW SOFTWARE UPDATE Your Guide to an Efficient Workflow A collection of today's workflow software packages Welcome to the Sign & Digital Graphics 2019 Workflow Software Update, a resource for those looking to automate or streamline print-related operations. These software tools—geared for wide- format print environments, automated finishing systems and more—can be the key to a smooth- running shop. And when you consider the impactful benefits it makes sense that you see if one is right for your shop. This guide is intended to be a starting place for anyone looking to upgrade his or her print work- flow. Contact individual vendors for more detail.